I am a poet-performer, playwright, and author of three editions of The Portland Bridge Book, the last two editions with Ed Wortman. I have been an often-enrolled student since 1984, giving up full-time seniority at Union Pacific's Albina Yards to support a couple of kids with words. The gamble, despite my depression-era grandmother's protests, worked. I now have several grandchildren of my own who don't miss many meals. I began putting my voice on the line as a profession in 1991, the year I originated bridge walks for Portland Parks & Outdoor Recreation. I continue to tell stories to large groups on tour buses and from sidewalks and inside the bascule pit of the Morrison Bridge. As an Oregon Chautauqua scholar, I performed BridgeStories—A Storytelling Slide Show across Oregon 1999-2001. I keep BridgeStories updated with images of bridges from all over the world, the U.S., and from Portland—home to some of the most amazing and historic steel bridges anywhere. Last count, I’ve entertained and informed more than 8,000 Portland-area students, their teachers, and family members. 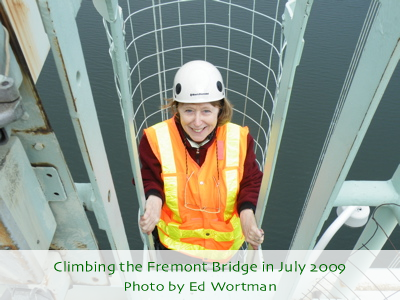 I recently began performing on bonafide stages—in October 2009, with the help of a Regional Arts & Culture grant, the music of Fats Domino, and film footage of my most recent climb to flagpole level on the Fremont Bridge (July 2009), I wrote and performed my one-woman show The Bridge Lady (soon available on DVD). My poem “Engineered” recently kicked off More Foreplay at the Someday, a 2010 Fertile Ground Festival performance sponsored by the Portland Area Theatre Alliance. Ed and I have helped edit a book about bridges written for third graders (published soon), and our step-by-step guide for designing and testing a truss bridge is now available for individual students as well as for whole classrooms. See Books, BridgeStories, Calendars & Curriculum for more information. Click here to read the "Timeline of Sharon Wood Wortman's Bridge-by-Bridge Evolution"